THE party line is that Stephen Thompson was within his rights to have a rant at his Dundee United players in the wake of their defeat to Motherwell. That doesn’t mean that those he was having a go at appreciated the chairman’s barbs. 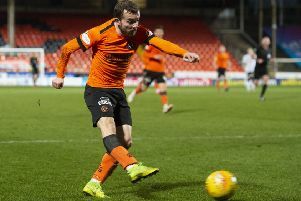 Before the match with Hearts, the home team headed into a huddle, but the biggest illustration of their desire to pull together and launch a last-ditch attempt to save their Premiership skins came in the 90 minutes that followed. An unlikely victory over the third best side in the land offers them a springboard but they now have to win at least seven of their last 12 games to climb out of bottom spot according to defender Gavin Gunning, who claims that ambition is more realistic than some of the comments coming from within the club throughout the past week. He huffed and puffed as he addressed them all. They have always had spirit, they have always been in it together, regardless what people have said, and railing against his team-mate John Rankin’s comments, they certainly haven’t downed tools. He also snorted at the notion that the squad is one of the more highly renumerated in the league. “What can I say? That’s football and [Thompson] pays everyone’s wages. But I don’t know whether we’re the third-highest paid in the league, though. Not mine anyway! “We didn’t discuss it in the dressing room before the game because we just focused on the match. Obviously it’s a s**t situation that we are in and what you get at the end of the season is what you deserve. You can’t blame anybody else. At the end of the day, it’s the players’ fault if we get relegated but I don’t think we will. Having engineered only their fourth league win of the campaign, they are at least making a pretence of believing that. On Saturday, they started better than a Hearts team that had been rejigged after the derby Scottish Cup defeat. A wobble in results and a dip in form have tested the belief and togetherness of fans of the Tynecastle side and caused a few ripples within the squad. But, having been grateful to goalkeeper Neil Alexander, who pulled off two superb saves to keep them within touching distance of their hosts at half-time, the visitors battled back early in the second period. Hearts equaliser came fromJamie Walker in the 48th minute and tested Dundee United’s mental toughness. But, while Hearts enjoyed greater possession, it was Mixu Paatelainen’s men who unearthed the most clinical finish. It came just after Hearts could have taken the lead but Abiola Dauda opted to shoot himself instead of square it to Nicholson, who was in space. Breaking up the park in the 88th minute, captain Paul Paton launched a 30-yard effort which finished high in the net. Hearts rained in a few corners and set pieces in a final flurry, and United substitute Henri Anier joined McGhee in the bad books, with two quick bookings seeing him dispatched. But United held on.